Cleanup was underway Wednesday morning in far southwest suburban Manhattan after a funnel cloud reportedly touched down Tuesday night. NBC 5's Susan Carlson reports. Cleanup was underway Wednesday morning in far southwest suburban Manhattan after a funnel cloud reportedly touched down Tuesday night. 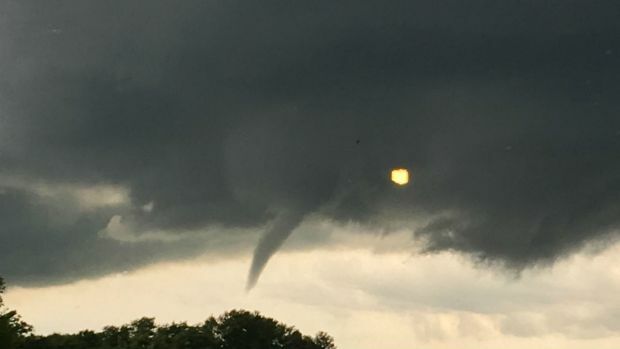 Frankfort locals describe how they dealt with the tornado warning that was issued Tuesday evening and the videos they say they saw on social media. NBC 5's Regina Waldroup reports. Village officials say a tornado was on the ground for about a minute - but that was long enough to knock down power lines, snap trees and damage a total of about a dozen buildings. The Manhattan Post Office was one of them, with its roof peeled back and flooding inside. It will not be open Wednesday, officials said, thankful that the damage wasn't worse. Even with some damage, village officials said all the structures remained intact. While they called it a tornado, the National Weather Service had not made that official determination, scheduled to weigh in later Wednesday.